We love going to the Home Depot free kids workshop events! 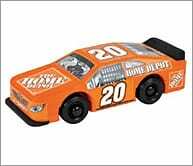 HEADS UP: Mark your calendars now – For the FREE Home Depot Kids Workshop where you can build a Free #20 Race Car building project on March 3rd from 9 AM -12 PM! Kids can build and race this #20 speedster race car.